Near the Rainbow Bridge, on the man-made peninsula of Odaiba, a “life size” rendition of a Gundam robot will stand guard as a representative member of the influential “Mobile Suit Gundam” television series, which this year is celebrating its 30th anniversary. The eighteen-meter-high armored figure, replicated right down to its double-nozzle jet pack, sits as the centerpiece of the Green Tokyo Gundam Project, an event that intends to raise funds for the Tokyo Metropolitan Government’s push for a more environmentally friendly future. Along with its numerous off-shoots and films, the sci-fi animation is set in an uncertain period of conflict in which robot vehicles, or “mobile suits,” are captained by children and used as weapons. Organizers are expecting 1.5 million visitors to arrive at Shinagawa Ward’s Shiokaze Park through the end of August to view (free of charge) the thirty-five-ton fabrication of fiberglass and steel up close and mingle at the surrounding booths and stalls selling robot models and t-shirts. A portion of the proceeds will be donated to the Green Tokyo Fundraising Campaign, an organization which will utilize the 800 million yen it hopes to collect by 2010 for such activities as the planting of roadside trees and establishment of lawns within schools. The statue itself stands about 59 feet (18 meters) tall and is said to be a life-size replica of the same robot from the popular Japanese anime. The head of the robotic statue can twist back and forth, and move up and down. Steam is periodically released from vents on the body. The statue also lights up at night, making it ominously seem as if it is guarding over the city. The statue will officially be on display in Shiokaze Park in Odaiba, Tokyo until August 31st. An exhibition tent, official souvenir shop, and food and drink stands are available during this time. A complete behind-the-stage documentary of the Gundam Robot bulding process is available here! Insultabotz: a robot so human that’s able to insult like you! Let’s face it, when it comes to humanize robots smooth-walking, sleek-talking and obstacle avoidance ability are the most requested features. But now think again: what’ more human than a robot that’s able to learn your own insults and talk nasty (and we mean nasty) when hitting objects (just like us, by the way)? The Insultabotz creeps forward with its six insect-like legs and will avoid objects in its way. It can detect objects with its infrared eye and move accordingly, and while it does so, it insults you! The Insultabotz robot comes with a re-recordable voice chip that allows you to pre-record any message or multiple messages (up to 15 seconds) and Insultabotz will repeat them in sequence every time it comes to an obstacle. Of course, they do not have to be insulting messages-but Insultabotz is not shy about giving you a piece of your own mind. Warning! Remember that not only can your parents hear what Insultabotz says, they can record messages on Insultabotz as well. So, listen carefully, the insult you hear may not be your own. Batteries (and insults book) not included. Insultabotz price is now US $ 69.99 (and that’s 30% off the regular price), so you won’t insult your credit card! Update: Jun 21st it’s Father’s Day! Don’t you dare giving your dad such a threat a gift ! 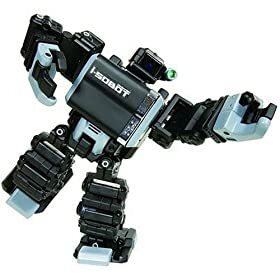 Tomy i-Sobot: don’t call it the “tiny robot” or a “toy robot”! According to the Tomy i-Sobot website, this is the world’s smallest humanoid robot in production, as per Guiness World Records. With 17 servos and only 6-1/2″ high, it could be. And I should be one to talk about the “smallest”. The Tomy I-SOBOT stands a mere 6-1/2 inches tall. 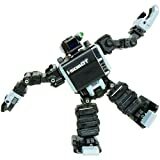 The articulated joints give the i-Sobot an incredible range of motion. And, it’s fun to pose. > The Tomy I-SOBOT requires 3xAAA batteries, and Tomy has included rechargeable NiMH Sanyo Eneloop batteries. The remote takes AA batteries (not included). Tomy says it should run for 60 minutes under normal use. When you power it on, the i-Sobot stands upright. A green “eye” lights up. A blue side-light on the side of the head can be turned on and off separately. There are two switches on the back. One is for power, the other is a channel selector. The remote control is infrared, and the IR sensor is on the robot’s shoulder. Tomy I-SOBOT is powered by 17 customs developed servo-motors and 19 integrated circuit chips. He features a built-in gyro sensor and comes fully assembled, ready for action. He can be controlled in a variety of ways: by pre-programmed actions, user programmed actions (done easily with the LCD remote control), or by real-time remote control or voice commands. Check this video on YouTube about i-Sobot hidden commands by AlphA202303! Revision3’s Systm is one of my favorite WebTV sites! Their talks are always thought-provoking. In this episode, they turned on a microcontroller-based project aimed at signal, via a servo motor, incoming mail on a Gmail account. It’s good starting point for microcontroller beginners, servos integration with open source languages (Python in this case) and a lot more. As their own forum users abundantly highlighted though, the video talk falls short when it comes to talk about software writing. Instead, there’s a long survey of different microcontrollers: Parallax Stamp (I’ve used a Basic Stamp back in 1999 and really enjoyed it), Arduino microcontrollers (a proudly italian product) and a few more just like the Kosmos Microcontroller Kit . Anyway, that said it’s a great tutorial! Go to Revision3’s Web Page.